Epionce products are designed to optimize the appearance and health of the skin by working at the core of the skin’s own protective and reparative systems. Epionce delivers a blend of active botanical ingredients to deeply penetrate the skin, strengthening your skin’s own mechanisms and helping to defy the effects of aging and disease. 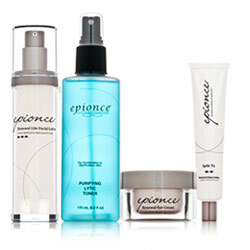 Epionce products give you smoother, more radiant skin that functions at its optimum. Founded by dermatologist Dr. Carl R. Thornfeldt, Epionce integrates 20+ years of research into this comprehensive and innovative skin wellness line. Rooted in science and backed by clinical studies that adhere to the highest standards, Epionce unlocks your skin's natural ability to repair, strengthen and protect itself.